Attention! Attention! The Eagle has landed! Seriously…it has! Or…they have! In the last week alone I have spotted four Bald Eagles. Three of them right here in Derwood. Two of them just today! So, I decided this Saturday we should do an Eagle Spotting trail run. Its kind of an annual thing. The nest (called an eyrie) that I have been watching the last four years is active again. You can see Momma bird sitting on the eggs…maybe its Daddy bird…who knows, but it is well worth checking out along with the other natural and historic points of interest along the trails of Meadowside Nature Center and beyond! Besides the eagle nest, there is the hidden, lost scary place (cemetery in the woods), the covered bridge, Pioneer Village, the ruins of Muncaster Mill and the Miller Lite Race Car in the middle of no where! You gotta see this stuff!!! Plus we’ll head out on the new trail to see how far they have taken it. Course: One mile warm up to see the sites then head on out and under Muncaster Mill Road all the way out on the new trail beyond the ICC. Creek Xing: Yes, stepping stones might be available but plan on wet feet. This run is a blast! 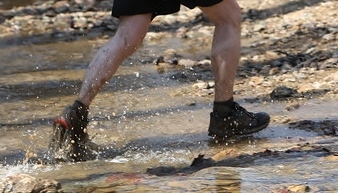 -Muddy Shoes Summer Trail Program is coming your way in May. We’ll be targeting The MD HEAT Race. Our own Nick Yeates is the Race Director Extroadinaire for this gem in August. Awesome after party, grub and give-aways…oh…and beer! -Don’t forget the Farm Park Challenge is coming up on Staurday May 5th! An awesome trail running event that’s the brain-child of Daryl Hultquist, one of the Godfathers of MoCo trail running. Here is the link http://farmparkchallenge.com/ that explains the different events going on and how to register. This event has beer too! …and pizza! Check it out!